Western Australian vet Felicity Harradine says she understands owners having reservations about snake avoidance training for their dogs but when it comes down to potentially saving the life of one of her four beloved border collies, she doesn’t hesitate. Dr Harradine says she sees a lot of snake bites at her practice—at least 50 a season. So not only does she do the avoidance training regularly with her dogs, she “absolutely” recommends it to her clients and even organises expert trainer David Manning to travel the two hours down from Perth to Bunbury do it. Manning says Dr Harradine is not unusual; he trains many vets, particularly those working in emergency care who see the devastating impact of snake bite first hand. “That’s not the customers they want—dead or dying dogs,” he explains. Manning is a former animal trainer (for UK film and television) and reptile specialist for Perth’s Animal Ark, where he is a director and one of many trainers providing snake avoidance training using an E-collar. “Through years of training animals for the film industry, I’ve always used positive reinforcement; that’s the standard way of training an animal but to positively train a dog for a negative like snakes, we just couldn’t see how we were going to do it,” he says. Trainer Daniel Mannix from the Victorian Dog Training Academy also uses the E-collar and says while there are others using positive training methods in that state, they have too many shortcomings. For example, using hand signals to recall a dog from a snake could take many hundreds of repetitions to be successful and having the dog avoid the snake then depends on the trainer being present. The Australian Veterinary Association (AVA) doesn’t support the use of E-collars. President Dr Paula Parker explains the concern is that punitive training could set up fear and anxiety behaviours in the dogs. 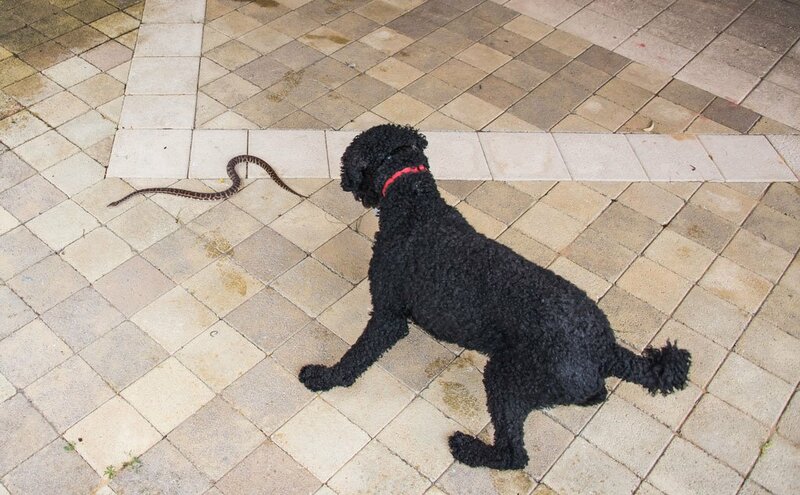 Instead, the AVA advises pet owners to mitigate the risks by walking pets outside peak snake activity time (early morning and late afternoon), avoiding bush, walking dogs on leads and keeping them inside when possible. However, Dr Harradine says dogs have been bitten even on leads and the risks are just too great not to do the training. In country Western Australia where she practises, deadly brown and tiger snakes are the most prevalent, and—especially in the lead-up to summer—the most active, aggressive and venomous. And she says it’s not just country dog owners who need to be cautious. Snakes can be anywhere, anytime. Manning first came across the technique in the United States while researching venomous snake handling as part of a Churchill Fellowship in 2012. He has since returned to receive intensive tuition on snake avoidance training from experts there. He says aside from vets, clients include regular pet owners living in suburbia, on semi-rural lots, campers, even gold prospectors. All have lost a four-legged family member to a venomous snake bite. “It’s staggered us,” he says. “This is our fourth year of this training and a phenomenal number of people who we’ve met have had a recent incident with a bite, where the dog has been envenomated and others not, but it has gone to the vet for observation,” he says. Dr Parker says the AVA doesn’t collect snake bite data, however a study in 1998 concluded about 6,000 domestic animals are bitten annually. They are predominately in rural areas with brown snake envenomation the most common followed by that of tiger and black snakes. It’s estimated 75 per cent of dogs survive with antivenom and just 31 per cent without. Vets say one of the biggest obstacles to timely treatment with antivenom is how dogs often respond to a snake bite. They can collapse and vomit and then appear to recover. However, other toxins are at work in the body that can result in paralysis and breathing problems, bleeding and kidney and muscle damage. At this point, it is a struggle to save the patient. Dr Harradine encourages people to consider the potential monetary cost of snake bite too. A vial of antivenom can cost more than $1,000 and sometimes a patient needs more than one. Then there’s the added expense of oxygen, drips and intensive care. In some of the cases that end up in major emergency centres, the bill has been in excess of $25,000. Snake avoidance training by comparison can cost as little as $195. Animal Ark’s training is surprisingly simple and takes less than 45 minutes. It’s conducted in a quiet area near natural bush. While chatting to the dog owner, Manning fastens the collar to the dog. Dog, owner and trainer take the animal for a short walk where they’ll come across a snake (one of the non-venomous species) on the path. If the dog shows an interest by going in for a sniff, it receives a collar ‘correction’. The correction on the lowest level (suitable for most dogs) feels on a human hand like a small massage-like impulse but, as the trainer explains, it’s the surprise of the stimulation rather than the strength that scares the dog and causes it to recoil. The walk continues, this time near a venomous snake locked in a special container so that the dog can smell the snake but not be bitten. The dog will then recoil without a collar correction. Manning says the training is ‘old hat’ in the US but relatively new to Australia. And he has many success stories, such as the one about a working dog that suddenly refused to go up a cattle-run—and when the owner checked why, he found a deadly dugite.